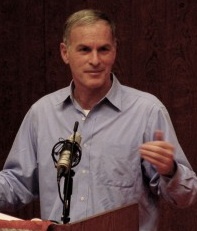 Norman Finkelstein has a new book out, This Time We Went Too Far: Truth and Consequences in Gaza. To mark it, here is an unpublished interview I did with Finkelstein in the late summer of 2006 at his apartment in Coney Island, New York City. His new book, Beyond Chutzpah, had just been released and he discussed his battle with Alan Dershowitz, the Holocaust Industry, the simplicity of the Israel-Palestine conflict, and why Abe Foxman only knows how to break kneecaps. MK: You call the "Case For Israel" a "spectacular fraud" which is pretty obvious to anyone reading it with even a cursory knowledge of history. Why then dedicate a book to deconstructing it? Doesn't it speak for itself? NF:No I didn't dedicate a whole book to Alan Dershowitz. What I did was use Alan Dershowitz as a peg for going through a luminous human rights documentary record, which ­ although it's quality is excellent in my view ­ it just collects dust. And it's important for people to know what human rights organizations which have a lot of credibility everywhere else in the world ­ what these human rights organizations are saying about what is happening in the Occupied Territories and that's just not known. MK: But why Dershowitz's book rather than any other? NF: Dershowitz's book was a national bestseller, it was influential, it was taken seriously so it's useful in this sort of exercise to juxtapose what an influential spokesperson claims as against what the record shows. MK: And you have done this before ­ you have deconstructed Joan Peters and Daniel Goldhagen. Was Dershowitz in a class of its own? NF: No I think the immediate antecedent for Dershowitz was Peters ­ it was the same type of book. Didn't work exactly the same way ­ in the case of Peters she had no public reputation so she relied on blurbs from virtually a Who's Who of American arts and letters to boost the credibility of the book. In the case of Dershowitz, as much as people dismiss him as a clown and charlatan and roll their eyes ­ the fact of the matter is that he very effectively makes use of his Harvard pedigree ­ it is a distinguished university and he has an eminent chair of that university and he makes use of those credentials to lend credibility to his work. So not exactly the same as Peters in terms of how the book acquired credibility but the effect is the same. MK: You reference other books by him ­ like "Why Terrorism Works." Are they equally lacking? NF: He got feathered by my claim that he has created a "Hallmark line for Nazi's," but essentially that is what it is. It's these little books with very little references which make outrageous claims with both a folksy and a fabricated tone. And if anyone else were writing it A. It would be dismissed for its lack of any scholarly content and B. It would be the subject of a huge amount of condemnation because the things he says are really outrageous. You know, to just make casually make statements like after every suicide bombing you should blow up a village. These types of crimes are the memorable episodes of Nazi war crimes during World War Two. MK: It was somewhat enlightening for a young person like me to see how it was received because, as you say, it was uniformly praised as a punchy polemic in support of Israel in places like the New York Times. NF: They all got great reviews. NF: Why? I would say it is several things. 1. The people that write these reviews ­ people like Ethan Bronner on the editorial board at the New York Times ­ the resident expert on the Israel-Palestine conflict who wrote the review for the Sunday Times book review ­ they are complete imbeciles. They have no idea about any of it, they don't read anything ­ they just read party propaganda. They read Peace Now people and think that is the limits of the spectrum - they haven't got the vaguest clue what's going on. You read an article last week in the New York Times by Greg Myre who's stationed in the Middle East and he said he had new information on the wall. He wrote something along the lines of "before the wall Palestinians moved freely between Ramallah, Jerusalem and Bethlehem." Leaving aside the fact that nobody moves freely in the Occupied Territories between the checkpoints, the searches, the roadblocks and all the rest ­ nobody moves freely. This fellow does not seem to know that no Palestinians are allowed in Jerusalem ­ there has been a closure since March 1993 ­ no Palestinian is allowed in Jerusalem unless you have a special pass. My closet friends who I visit every year they haven't been to Jerusalem for 10 years and this guy says that before the war they could move freely. And this is where they get their information. NF: The people who write the reviews. They get their information from the New York Times, the Times guy is living in the American Colony Hotel in Jerusalem, he sees Palestinians ­ there are obviously Palestinians in Jerusalem ­ so he thinks, "Ah, Palestinians move freely". So one is: The most generous interpretation for why Dershowitz gets the praise is complete ignorance. And then there is the fact that he has that pedigree and people defer to it. Can a Harvard professor systematically, methodically lie in a "scholarly" publication? They can't believe that ­ it's not possible. Harvard professor, pathological liar, can't be. Harvard professor, Felix Frankfurter professor of law ­ teaches legal ethics at Harvard ­ can he be what Finkelstein claims? So part of it is, the cliché, cognitive dissonance. They can't reconcile the fact of his pedigree with the reality of what he does. The third part is, of course, that he says what they want to hear ­ it's the party line. MK: In the US is there anywhere you can get your side of the argument? There's not, is there? NF: There is nobody really disagreeing with Dershowitz ­ I don't even think they think his statements are extreme. MK: Really? It's different in Europe. I don't know how The Case For Israel was received in Europe. NF: I don't know if it was published in England. MK: I think it was. But how do you think the mainstream will react to your book? NF: I have lots of experience in these sorts of things and I think my predictions will bear out. What they are going to do now is they are going to ignore my book and ignore Dershowitz's new book and that's going to be the pretext. They are going to say, "We didn't review Finkelstein and we didn't review Dershowitz." It's become a sandbox fight between these little boys and we are going to stake the higher moral ground. So even though Dershowitz's book came out in the first week in August it didn't get a single review ­ Publishers Weekly hasn't even reviewed it. MK: What, The Case For Peace? NF: Yeah. No reviews at all and it has been doing very poorly in Amazon. It ranges between 100,000 and 150,000, which is a very poor showing. And I think that is how they are going to extricate themselves from this little mess because it is very hard to review his book without reviewing mine. Then there is the whole problem of how they ignore all this pre-publication publicity. They would never ignore a book that had the pre-publication publicity that ours had and the pretext is going to be "this is a sandbox" and that is already what Harvard Bookstore said. MK: Have they still rescinded the invitation for an event? MK: I was reading online about the Chapter 16 of Dershowitz's book about you/Chomsky/Cockburn and it is really quite vicious. And you get it from all corners ­ you have Leon Wietsler saying you're something you "find under a rock," and you get misrepresented being accused of being a "Holocaust denier". On a personal level, how does it effect you? NF: Nothing at all. Sometimes I take pride in my teaching, so when Dershowitz says I was fired for "mental instability" and "abusing students" that, of course, angers me a bit. The only thing I don't think he will get away with is what he said about my late mother. That is going to have to be corrected. MK: Yes. That is disgusting. NF: That's going to have to be corrected. I'm not sure yet how or what but it is going to be corrected. MK: Is that an effective way of shutting down dissent in America? NF: I think it used to be. I don't think it's working much anymore. I think people are rolling their eyes at the "anti-Semite", "Holocaust denier" stuff. I think they have overused it and cheapened the currency by overuse. I think so, I can't say for sure. MK: I wanted to move on to the Holocaust. In your book "The Holocaust Industry" you say that the Holocaust has been used to deflect criticism from Israel. You say that the Holocaust was ignored as a phenomenon after World War 2. NF: Everybody says it. Alan Dershowitz says it. If you look in his book he says, "I don't remember having a single conversation with any of my friends or anyone else about the Holocaust growing up ­ not a single one." And everybody ­ if you read the literature ­ they all say the same thing: It was completely absent from American Jewish life except as something to be ashamed of ­ that the Jews went like sheep to slaughter ­ that would be the common refrain. Well there were two. 1. Was like sheep to slaughter, which was meant to be a collective embarrassment for all Jews. And then there was a particular embarrassment for survivors: That if they survived they must have done something dirty to survive. So there was always that question with the undercurrent insinuation: How did you survive? The assumption being: that you must have done something dirty. Apart from that it was completely absent. MK: So when did that change? 1973? NF: Towards the end of the 1960's the Holocaust Industry really takes off. MK: Was it the same deal in Europe? NF: There are different issues that arise in places like France so I'm often criticized for making generalizations which don't apply to Europe ­ I think it applies more than some people want to believe but probably there are differences in place like France, or, at least, so I'm told. MK: You've noted before that you disagree with how certain Jewish writers and commentators say that there is a "singularity" and that it is "unique amongst human barbarity". NF: Well everything has its own singularity ­ that's a cliché ­ just by virtue of time and space everything is unique. And secondly, there are aspects of the Nazi Holocaust, which are unique ­ aspects of it. But there are aspects of lots of genocides that have unique features. The question is: Does a unique feature of a genocide then warrant its being placed in an entirely different category from all other genocides. The American genocide of the Native American population, in my view at least, has quite unique features and actually interestingly unique features ­ for example, it was a genocide that was carried out by what were considered to be the leading Enlightenment figures of the time so the assumption normally is that in order to execute a genocide you need a genocidal ideology. So there's all this focus on trying to understand Hitler's world-view and Nazi ideology as if you understand the ideology you can understand at least aspects of the genocide. In the case of the Native Americans it was a genocide which was executed by people who's world-view was firmly entrenched in the Enlightenment and they were considered the leading Enlightenment figures of their time ­ Jefferson, Ben Franklin, Madison ­ so that's an interesting aspect ­ maybe its unique, I don't know. So all genocides have unique aspects to them ­ ours was done in broad daylight; in the case of the Germans ­ I'm not saying the Germans didn't know ­ but it was done in the dark and it could not have been done in peacetime, it had to be done in wartime. Other genocides you'd have to look at them individually. The Armenian was wartime, Rwanda's wartime. I don't know how exactly you would classify the American case. MK: In terms of the Israel-Palestine conflict you say it is "remarkably uncomplicated" which I agree with but if you read about it in the mainstream and go to lectures you get six of one half a dozen of the other ­ its really complicated, you have to look at both sides, no one really knows the truth. Why is it presented like that? NF: Because the stark truth is an unpleasant truth and so the pretext is that we see and what seems so stark, the claim is, it actually isn't and so it's supposed to make you question your most elementary, your most basic moral judgment and sensibility. NF: An occupation is wrong, building a wall around these people is wrong, shooting children for throwing stones is wrong, stealing peoples land is wrong ­ that's not very complicated at all. NF: I was in Occupied Territories a couple of weeks ­ I talked to soldiers ­ I didn't hear soldiers supporting the wall ­ it's an embarrassment, it looks hideous, you look like you're caging in human beings, it looks like a ghetto and an Indian reservation. So you couldn't even find them defending it. MK: What do you favor for the Middle East? A two-state solution or incorporation of the West Bank and Gaza into Israel? NF: I don't favor anything, I simply state what the facts are. If you look at the record it is Israel backed by the US who have been the obstacle to the resolution of the conflict, which the international community on the one hand and the Palestinians have supported. That's the record. As to what I favor, I am an old fashioned person, a communist with a small "c", I don't believe in states or borders ­ it's not going to happen in my time. So I don't favor ­ I'm just saying this is the record I just state the facts. And when you look at the record it is very difficult to make the claim that the Palestinians have been the obstacle to a resolution of the conflict. MK: But if what you are saying is correct and I'll assume it is, why have the US and Israel blocked all these attempts at creating two-state solution? NF: I think it is a combination of things. For Israel it is a mixture of ideology and practical concerns. In the case of US, it's a desire to appease Israel because it is an important strategic asset for us in the Middle East and the Israel Lobby; I think it is a combination. I don't think you can point to one factor. It's not easy to point to an over-arching factor. MK: What about the Gaza disengagement plan this summer, is that a step towards peace or merely a way to tighten the grip on the West Bank? NF: Well, there are three things. 1. Judging by what experts say ­ people like Sarah Roy at Harvard ­ the conditions will probably get worse for the people in Gaza, they will deteriorate even more than have in the last 40 years. 2. Every human rights organization says under international law the occupation continues. Human Rights Watch issued a statement August 19th saying it is still an occupation under international law ­ Israel controls the borders, Israel controls the airspace, Israel controls the water, Israel controls what goes in and who goes in, what goes out and who goes out ­ they therefore have full military control over the area and under international law if the external power has military control the occupation continues. Bt'Selem issued a report in March 2005 and they also say that the claim that the occupation ends if Israel disengages is questionable and they went through all the reasons why it doesn't end. So what we can conclude from the so-called disengagement is that conditions will probably get worse, the occupation hasn't ended and Israel will consolidate its grip on the occupied West Bank. MK: Why did Israel do it? Was it a public relations exercise? NF: I think they wanted Gaza. It goes back to when Ben-Gurion wanted Gaza but now they have to make compromises so they decide to sacrifice 6,000 settlers for 400,000 settlers. NF: Nothing just happens. There's no inexorability in politics, nothing just happens. MK: But will the fact people have been chipping away for so many years have an effect. NF: There's no organization at all in the Occupied Territories at this point that is not in a state of complete despair and feeling of total impotence. There is nothing happening there, there's a collaborationist leadership, quislings and there is no chipping away going on. MK: In the book, you put pro and anti Israel in quotation marks. That's an interesting characterization. I read Tariq Ali the other day say that "the joke in Left circles in the US is that if the Americans were to dump Israel for its own imperial reasons, to put pressure on them and move them out, the only two people in the country to stand up to save Israel would be Noam Chomsky and Norman Finkelstein." The irony there, of course, is that you and Chomsky are always characterized as "anti-Israel". NF: I have no special affection for any state so whether it's Israel, the United States ­ I am not "pro" or "anti" Israel but certainly I will defend the human rights of Israelis that are living there and none of them should suffer. MK: Is it just a spurious characterization? Does it mean anything? NF: The most "anti-Israel" person in the US is probably Alan Dershowitz ­ he uses Israel to pretend that he has got chutzpah when of course he is just saying what the party line tells him to say. Yesterday I met up with Human Rights Watch people and I mentioned to someone there that, very curiously, in The Case For Israel he never once mentions HRW ­ that was an odd sort of aberration because there are reports from HRW that are not different from Amnesty and B'Tselem ­ they are saying the same thing. So why does he attack Amnesty and B'Tselem but not HRW and the answer I gave is that HRW is American based and he is not going to tangle with people who are going to give him a hard time. It's easy to attack Amnesty who are based in London. B'Tselem is a bunch of Israeli leftists. So he always chooses the easy targets and then pretends he has chutzpah and so he goes around saying bomb villages, torture Palestinians ­ oh, it takes a lot of courage to talk about torturing Palestinians! He just uses Israel and as they use it, they help sow the seeds of hatred over there about which they couldn't care less. They don't care if they sow hatred, it's all a big bedtime fantasy for American Jews ­ Israel doesn't really exist as a real entity ­ it's a bedtime fantasy and so they are going to get even with the goyim, meanwhile, of course, they do everything they can to live like the goyim ­ they want to go to Martha's Vineyard and to where all the goyim live and they want to imitate them but then they harbor this fantasy hatred so you see I cite in the book one guy says, "and before Israel is next destroyed we are going to blow up all the countries in the Middle East, we are going to send nuclear weapons and destroy them all." These are really ill people ­ very ill people with their fantasies. Israel has never existed for them ­ they had no interest in the first 20 years of its existence, I've gone through the literature. None of them ever mentioned it. The only one who was interested in it was Noam Chomsky. And the idea that they care about Israel's well being ­ they don't care about anyone's well being. That's why I've always found it silly when people hurl this epithet at them "Zionists" ­ they have no ideology aside from what suits their interests ­ they will be a Zionist today, a fascist tomorrow, a communist the next day. The stupidest thing to do it to assign an ideological conviction to people in power. When they discuss the neo-conservatives they talk about these characters that taught at the University of Chicago and they probe their ideas ­ that's such nonsense. They have no idea whatsoever ­ they are really post-ideology ­ they are just interested in power. They are not Zionists. There is a large element of racial chauvinism ­ it's a kind of ubermenschen mentality: the Jews are so superior ­ there is that ­ that's true. But the idea that in some sense they are committed to the Israeli people. The overarching concern however is what is useful to them. MK: You mentioned racial chauvinism. Your detractors often cite the fact that your work often cited by far-right groups. Does that worry you? NF: No. You can't control who is going to cite you. They cite Raul Hilberg ­ Hilberg was the one who said that the Jews were using the blackmail weapon against Switzerland ­ they cite him. MK: Do you think that it strengthens the far-right groups that no one in the mainstream addresses these salient issues. NF: I don't think the people on the far-right read what I say because they couldn't possibly support it because I start off from the premise that what all the historians have said about the Nazi Holocaust is right. MK: You talk in your book about the Anti-Defamation League and how they do the opposite of what they say they do: They escalate anti-Semitism rather than stop it. NF: Well first of all if there was no anti-Semitism people like Abe Foxman would have to get a real job which would be, from his point of view, a tragedy, especially with his qualifications. Probably the only job he could get is breaking kneecaps. That's the only thing he knows how to do. The claims of the "new anti-Semitism" or, even anti-Semitism at all in the US, are ridiculous. It exists but it is so marginal and it's institutionally meaningless. Being Jewish does not prevent you from getting a job. I've read commentary that Jews are targeted for murder in the US ­ I don't think the homicide rate for Jews is that high! Of course it exists ­ you go down South and the idea is that Jews have horns but who cares because they are all crazy themselves. MK: How does it compare to the anti-Arab sentiment in US? NF: Look there is no comparison. It's silly to even make comparisons like that. There is, I am sure, some sort of animus towards Jews. There is animus towards everyone: This is the US, everyone hates everyone. You are not going to be surprised. In NY, you don't like Koreans, you don't like Albanians. NF: I happen not to think it's so bad. Maybe because I am in NY but I feel there are fairly high levels of tolerance. Matt graduated from University of Leeds in the UK. Since then he has completed a Masters in Journalism from Columbia University in New York City, where he lives now. He has written for the Guardian, Chicago Tribune, Newsday, New Statesman, amongst others.